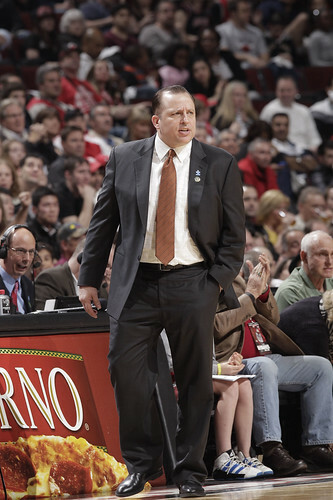 Who knew March NBA Coach of the Month Tom Thibodeau also was an amateur theologian? Though perhaps that’s what happens when you lose a second game in a row for the first time in almost 14 months, which the Bulls did Monday in a 99-93 loss to the Houston Rockets. Although Richard Hamilton returned from his shoulder injury to start while Derrick Rose still was out and the Bulls maintained their league best record at 42-13, Thibodeau turned to symbolism to express his disappointment at the Bulls blowing a 13-point third quarter lead. I loved the allusion, which comes, I believe, from a famous parable about a pastor walking across a bridge. A man hands the pastor a rope and then holding the other end jumps off the bridge. The pastor is stunned as the man cries not to let go, that only the pastor, his coach and guardian in a sense, can save him. Initially, the pastor searches for all sorts of devices, like a hook to grasp. But there is none. Finally, the pastor says there is only one answer: He’ll provide the counterweight, but the dangling, flailing man must pull himself up. The pastor will be there for support, but he cannot provide the majority of effort. Is Thibs absolving himself? Hardly given what we know about Thibodeau. He’ll do his part and his work, and it led to another Coach of the Month award announced Monday before the game with Houston in the United Center. But there also comes a time when you have to save yourself. And Thibodeau may be saying with the Bulls first two game losing streak since Feb. 5-7, 2011, that the time is now with Boston on national TNT Thursday. 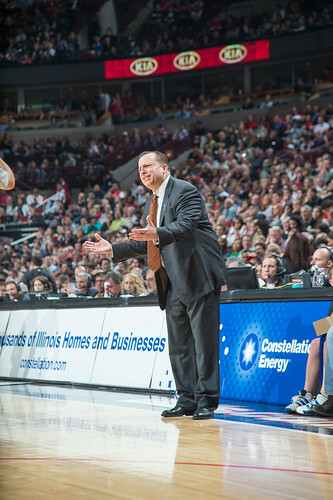 Phil Jackson would be proud, though I think Thibs prefers Jeff Van Gundy’s aphorisms. Although I enjoyed Thibs’ homily, I’d have to debate his treatise because it is becoming ever more clear how much the Bulls miss Rose. There remains a possibility Rose could return Thursday, though it would seem more likely early next week in the New York home and home before Miami. It’s also nothing to be ashamed of. Rose is the reigning MVP, in effect, the most important player in the NBA. The Bulls have done marvelous things and made their fans proud the way they prospered without Rose, now 14-7 overall with Rose’s toe, back and groin issues. But once again even with Hamilton’s return — and I thought he did well for missing 27 of the last 32 games with groin and shoulder problems — the backcourt provided little. Hamilton, C.J. 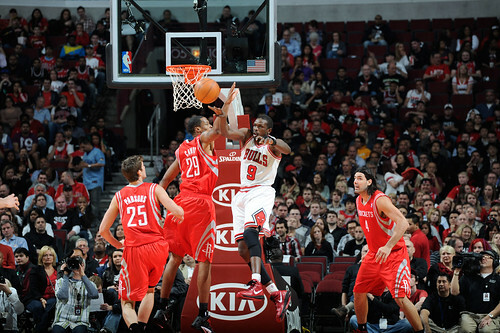 Watson and Ronnie Brewer shot a combined six for 21 for a total of 14 points. John Lucas was four of nine for eight points, but neither he nor Watson see the floor very well and tend to overdribble looking for their own shots. I don’t blame them. That’s the way they play. During Rose’s absence, the Bulls have thrived with the interior passing of Joakim Noah, Carlos Boozer and Luol Deng, and Boozer did have a team high seven assists Monday. But it’s still a point guard dominated offense, and it helps to have the game’s best point guard. Whether he’ll be at full strength when he returns no one knows. 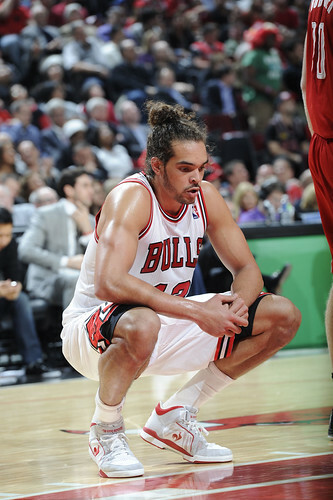 But at some point soon the Bulls need to begin to find out. Thibodeau is a terrific coach and likely the front runner for an unprecedented second consecutive coach of the year award. 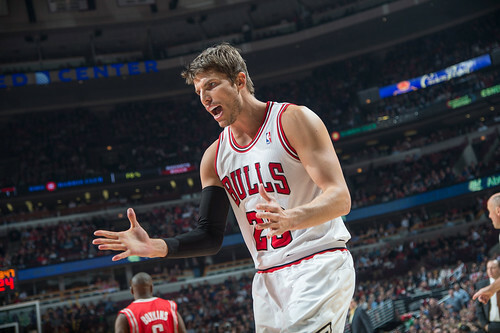 He’s made believers of the Bulls with his constant refrain they have enough to win with no matter who is out. Believing is often achieving in life, and that motivation and confidence is a big part of leadership and coaching. Still, talent matters, and without Rose it does remain a fragile mix, at least to me. It’s a tough case to build with the league’s best record, but this Bulls team is playing for more than that now. It was hardly a perfect effort from the Bulls, though Deng with 24 points on nine of 14 shooting, Boozer with 16 points and 13 rebounds in addition to his seven assists and Joakim Noah with 15 points, nine rebounds and four blocks did all they could. But it was too much imbalance to overcome this time as the guards didn’t push the inside enough after halftime and the defense relaxed with even the usually reliable Deng being caught out of position. Although the opponents get more interesting, the schedule eases for the first time this season with one game in the next five days. Then three in the following seven days, the most off days the Bulls have enjoyed all season. Were they just looking toward that rest and taking their foot off the pedal? Were they worn out with pushing so hard for so long with so many obstacles, in effect, calling for someone to give them a hand, a rope to pull them up, if you will? Is Thibs’ now saying to them it’s on them? That it’s their team and their season and time for them to take ownership? It’s not exactly his style since where is he going but to the film room and to maybe draw up 200 new plays. But it is also about leadership. He is not accepting merely being in first place despite playing without the league MVP. Good for him. I didn’t think he could say that, but, after all, we are on the Internet. Actually, the Bulls looked like they were going to have a quick turnaround from that horrific loss in Oklahoma City Sunday. Hamilton, his right shoulder with a protective sleeve and stretching out his arm at times, seemed good. He got a miss back early on a Deng offensive rebound and hit an open three. He moved well, and though he committed five turnovers he showed he wasn’t afraid to move the ball in the team’s style and look for better shots. Thibodeau did blame the team’s shocking 19 turnovers which Houston cashed into 25 points for some of the biggest issues of the game. Though not really having true point guards is a problem. The Rockets, 29-25, got off to a strong start behind Luis Scola, who would finish with 18 points, 12 rebounds, six assists and there blocks. And imagine what he would do if he could jump over a tapeworm. Goran Dragic led the Rockets with 21 points, and he is most known to Bulls fans for being jumped over by Rose on a dunk in Phoenix. 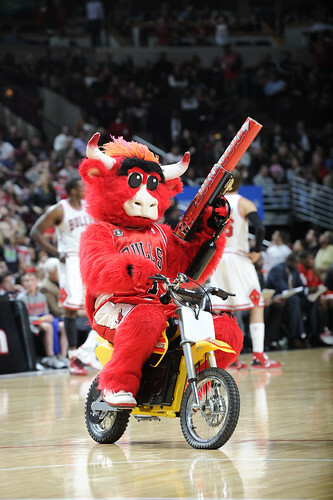 Though he got the last laugh on the Bulls guards trying to find him Monday. And he isn’t even their regular starter with their lead backcourt of Kyle Lowry and Kevin Martin both out injured. 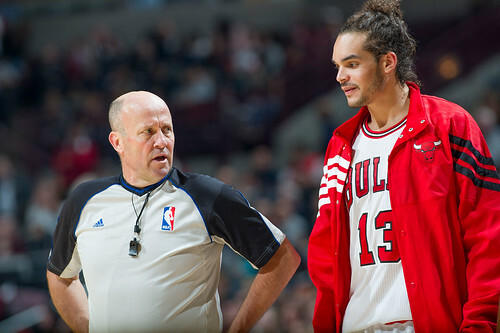 Which probably made Thibs’ angst all the more acute. 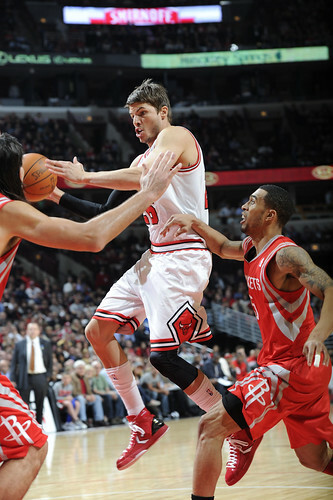 Though point guards overwhelming the Bulls hasen’t been unusual. With Rose out, opposing point guards have been the leading scorers for their teams against the Bulls in six of the last nine games. 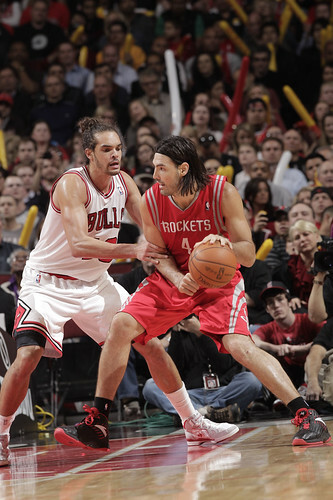 Scola actually did most of his damage against Noah early, though it is a conundrum Thibodeau faces with defense. 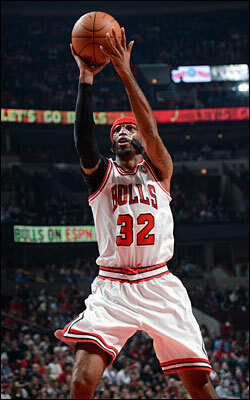 We know it’s not Boozer’s forte, though his scoring is essential. And, if anything, the Bulls erred in not going to him nearly enough, though that is the problem with scoring oriented point guards. 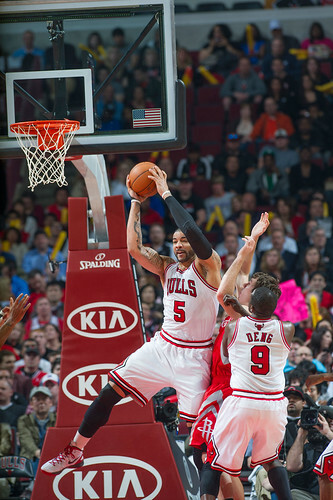 Rose’s passing and defense are much underrated because of his munificent scoring. The Bulls generally put Boozer on the less offensive interior starter, who was Marcus Camby. Camby did shoot well early and finished with 12 points and 11 rebounds, but generally is not an offensive threat. The problem is the Bulls defense is a help defense, and Boozer is not particularly a help defender. He generally does well enough on his man, but it does leave the other defender with more responsibility. Thibodeau generally handles it by trying to go to Boozer and then bringing in Taj Gibson, which he did late in the first quarter as the Bulls drew within 26-22 after the first quarter. Deng, who had a tough time Sunday in Oklahoma City, came on strong offensively, going into the post frequently with a mismatch he had with rookie Chandler Parsons, and Noah was active on the offensive boards. 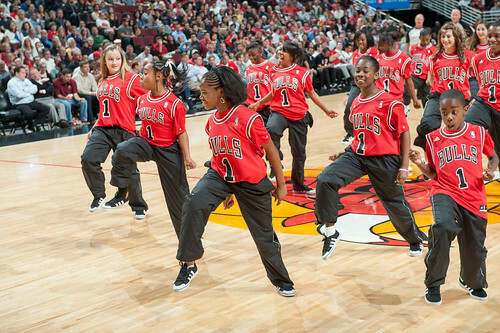 The Bulls would have more interior points before halftime than they had all game Sunday. It would be a beautiful second quarter for the Bulls as they raced out to a 49-34 lead before slipping a bit to a 51-40 halftime lead. The Bulls shot 63 percent with an 18-6 rebounding margin as Gibson started it strong with a pair of runouts for scores. Omer Asik was big inside thwarting the Rockets in the lane, and the passing was beautiful with Noah finishing a four-pass sequence with the ball never touching the floor leading to a dunk and Rockets’ players heads spinning like they were in Beetlejuice. 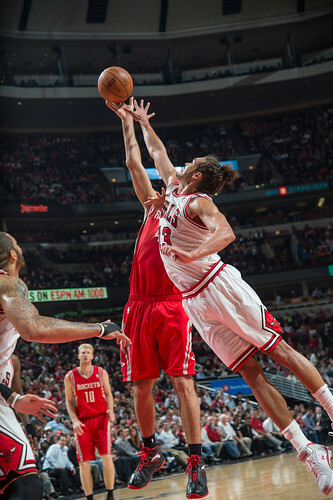 But then came the fateful third quarter, much like Sunday but without so many embarrassing dunks, as the Rockets outscored the Bulls 31-19 with a 14-1 run getting them into a tie at 62 with three minutes left in the third. The Bulls began casting up long jump shots, which they tend to do of late when things go bad, almost in a panic, it seems, rather than having confidence in their system. 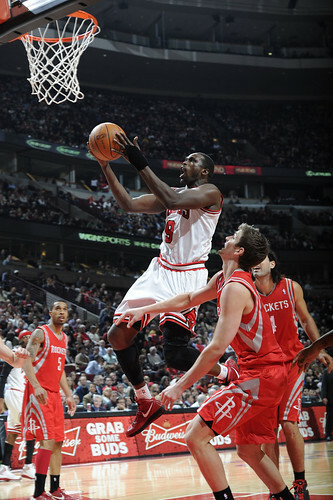 It was 71-70 Houston to open the fourth quarter and the most curious of rotations sunk the Bulls. Coach Kevin McHale went with little Earl Boykins and shooter Chase Budinger, neither of whom had played much in the first half. Budinger was part of that Houston defensive meltdown early in the second quarter against the Bulls reserves, but he would have his revenge. After Boykins hit a jumper over Lucas, Budinger hit a three for a 78-70 Rockets lead and Thibodeau went back to Deng, Noah, Boozer and Watson. Boozer made a 13 footer, but Budinger found space for another three. Then he took advantage of a Deng drive to leak out and the Bulls lost him in transition for another three to put Houston up 81-72 with 9:38 left. 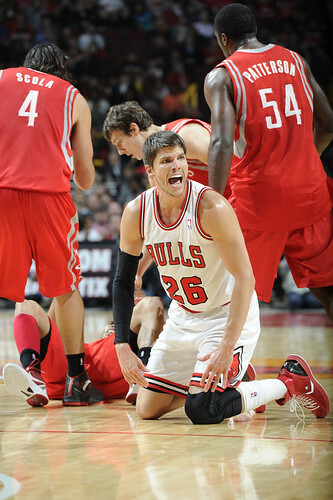 The Bulls seemed more shocked than defeated even though that ended a 13-2 run. 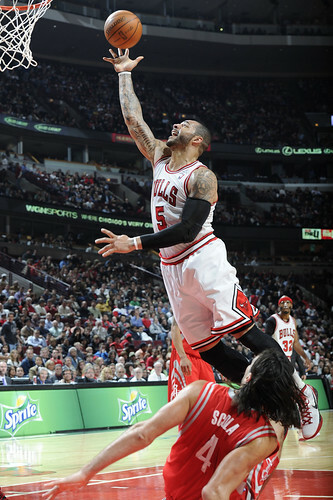 Boozer came back with another jumper as he was five of six for the quarter. But Watson missed a long three and Boykins pushed the ball ahead for a score. Noah was fouled and made one of two, but Boykins then got open for a three and 89-75 Houston lead with 7:33 left. Your point guard defense is really a problem when Boykins has more points than either of your point guards. And in just under 16 minutes. After leading 90-78 with 6:46 left, Boykins ran out of legs and started missing. The Rockets would fail to score in eight of their next nine possessions. It seemed the Bulls could survive. But Courtney Lee, who had 13 points after a slow start, stole a Lucas pass, Korver missed a three, Noah missed a followup tip and Lucas another jumper. 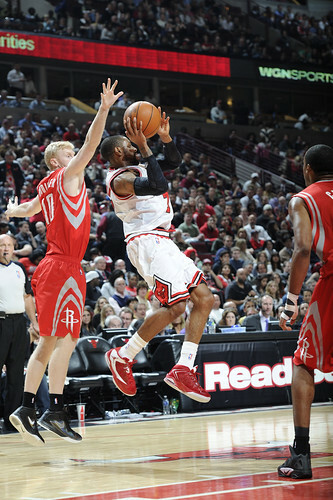 The Rockets seemed to be aiming now knowing one or two baskets would end it, and the Bulls came to life. 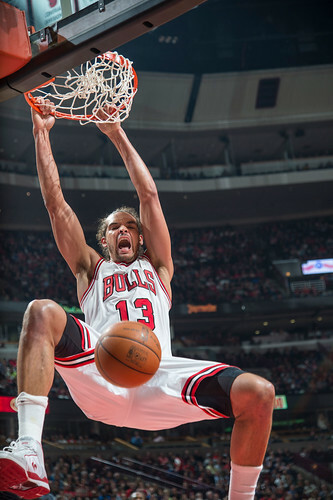 Noah dunked a nice bounce pass from Boozer and Boozer went up with a Deng assist. Korver made a terrific block on what seemed a sure Lee layup, and Boozer ran out for a score on a pass form Lucas. 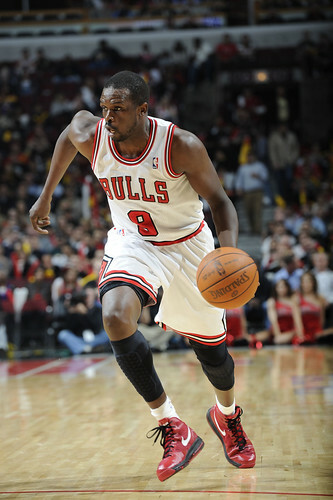 Then after the Bulls trapped Dragic into a turnover, Deng made a 20 footer with 1:11 left to bring the Bulls within 92-88. Could they? But Lee dribbled left and pulled up to make a 15 footer, after which Korver trying to get a shot up fumbled the pass for a turnover and foul and that was the end of the comeback. 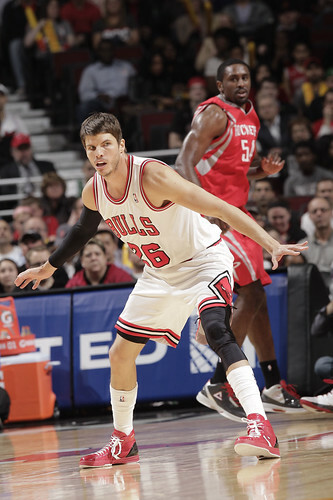 The Bulls would outrebound Houston and have a huge 26-10 edge in inside scorers. But they would just not have enough scoring again. In that fable, by the way, the pastor lets go of the rope. Could it be there are limits to what you can do and you have to accept them and sometimes fall? Or that if you pull and take responsibility all you worked for can be saved? It should be an enlightening time ahead.